Today we have leaked picture and details of a new motherboard for TR4 socket, the MSI X399 SLI Plus, a budget friendly model that will give life to the AMD Ryzen Threadripper CPUs by means of a 10 phase VRM that is attached to eight DDR4 DIMM slots in Quad Channel configuration along with three PCI-Express 3.0 x16 (2x steel-reinforced) slots compatible with NVIDIA SLI and AMD CrossFire configurations along with two PCIe x1 slots. As far as storage is concerned, we have a total of eight SATA III 6.0 Gbps ports along with three M.2 ports for SSDs. 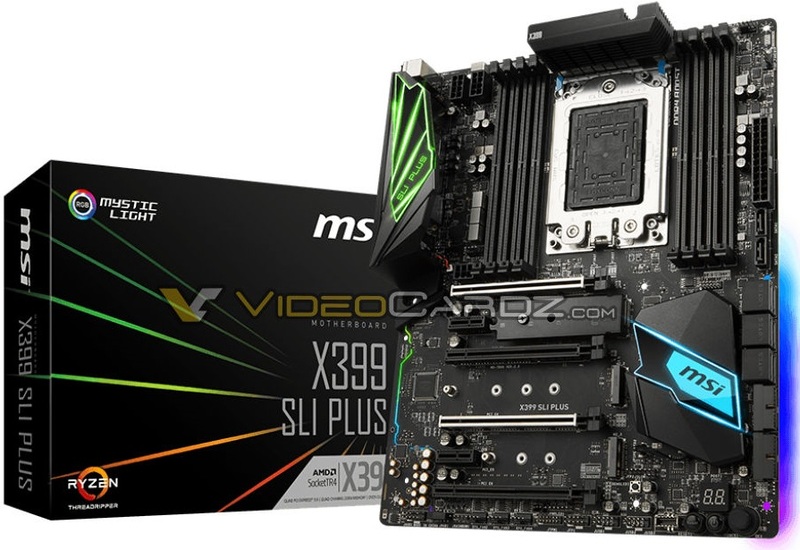 The information we know about the MSI X399 SLI Plus completed with on / off, reset and overclocking buttons, the use of an aluminum heatsink on the first M.2 port to reduce the high temperatures reached by the SSDs. Three zones with RGB LED lighting (rear panel, Intel X399 chipset and audio zone) configurable in 16.8 million colors and with various lighting modes, and comes to life through a 24-pin ATX connector next to EPS 8 + 8 pin connectors.